Identification. The Yellow-mantled Weaver Ploceus tricolor has a striking plumage but is a quiet weaver of the forest canopy. It is black with a yellow hind-collar. The breast and belly are chestnut in the male and matt black in the female. The head of the juvenile is chestnut. Two other weaver species are similar in appearance. Subspecies castaneofuscus of Vieillot's Black Weaver, however, is noisy and active, has no yellow collar, and has a pale eye. The very rare Golden-naped Weaver has a yellow hind-collar but differs in having a yellow line down its back. P. t. tricolor Sierra Leone to Congo (red on map). P. t. interscapularis, in DRCongo, Uganda, and NW Angola (blue on map). 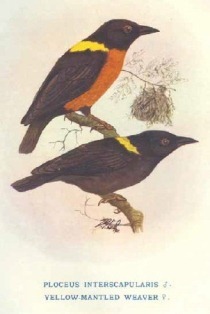 The male of this subspecies is like the nominate. The female differes from the nominate female in having a duller breast and belly, and a red eye (rather than brown). Habitat. The Yellow-mantled Weaver inhabits the high forest canopy, particularly along rivers or near swamps. Food. It feeds on insects, including grasshoppers, crickets, ants, caterpillars and butterflies, termite alates; small fruits and berries. It forages in foliage usually >25 m high, searching on small twigs, and also sallies above the canopy to hawk insects. 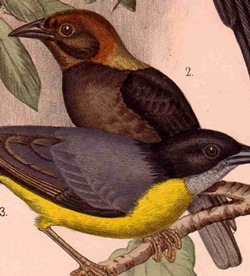 The Yellow-mantled Weaver searches the bark of dead trees like a woodpecker, working up the tree trunk in an upright posture, and in a spiral direction. It flies to clusters of dead leaves in pursuit of insects trying to escape. Its dipping flight between trees is reminiscent of a woodpecker. It may be found in groups of 4-6 birds, and joins mixed-species flocks, especially at fruiting trees. It does not descend to the undergrowth, is usually silent, and thus easily overlooked. Breeding. The Yellow-mantled Weaver is a monogamous, colonial nester, with up to 50 nests (average of 11, in 52 colonies in Liberia); one colony at Kumasi in Ghana contained about 500 nests. In mature forests in Liberia, 12 of 31 colonies were close to Palm-nut Vulture Gypohierax angolensis nests. The nest is a coarsely woven retort with a wide entrance tunnel. The nest is suspended at end of a thin bough at 20-50 m above the ground. The nest is constructed of rootlets, vine tendrils and fibres, and is lined with soft fibres. The eggs are white, almost translucent, or plain blue. The African Harrier Hawk Polyboroides typus is a major nest predator in Liberia. A colony in Ghana was destroyed by crows, harrier hawks and other raptors. 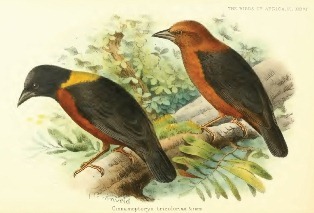 The Yellow-mantled Weaver is parasitized by the Diederik Cuckoo Chrysococcyx capius.